"SEO is one of those mysterious and challenging topics for musicians who want to use search engines to promote their music, and who understand how powerful it can be. If SEO matters to you, but you're not sure where to start or how to do it: we have something great to give you. 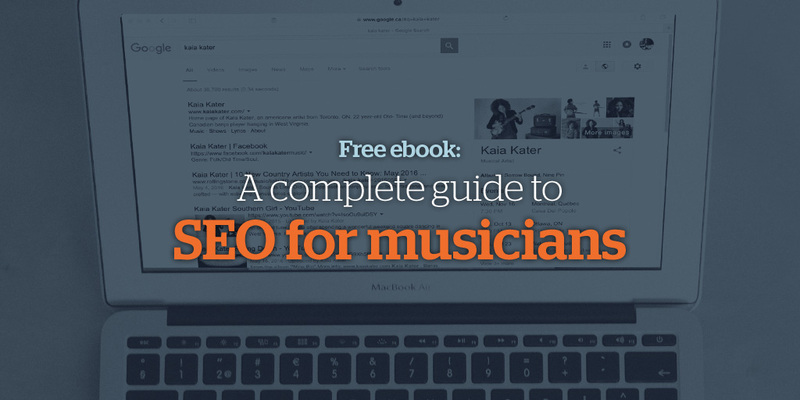 Download our comprehensive A Complete Guide to SEO for Musicians eBook to learn everything you need to know about optimizing your band's presence in search engines. It's completely free to download, no strings attached. Our goal is to help musicians everywhere take better advantage of the power of search engine marketing. We've done an immense amount of work to research and prepare this comprehensive SEO guide for musicians, and it's written in a way that's easy to follow and actually use. There's no fluff. Just pure, practical substance that you can sink your teeth into. We hope you put this eBook to good use to improve your band's search engine presence in a tangible way. We invite questions, feedback and new creative ideas for using SEO to promote music. Happy SEO'ing! Build a band website that's SEO-friendly. Bandzoogle is easy to use and offers built-in tools to optimize your website for search engines. Sign up free with Bandzoogle now."